Have you ever heard someone say that “Catholics believe they are re-sacrificing Jesus” in the Catholic Mass? I have. And guess what; that’s not the teaching of the Catholic Church regardless of what you might have heard! What follows is what is really happening in the simplest terms I can communicate. Tell a Protestant you made a sacrifice at Church, and they might imagine you mean you took out a knife and plunged it into an animal at an altar, or worse (as some people mistakenly believe Catholics teach) – you re-nailed Jesus to the cross again (and again and again). Tell a Protestant you gave (or received) and offering, and they’ll typically imagine putting money into a plate or bag as it is passed around. Catholic teaching is not that a priest is “crucifying Jesus” again, or that Jesus is dying again for our sins in the “sacrifice of the Mass.” Then what exactly is Catholic teaching on the Sacrifice of the Mass? In Catholic teaching, there are actually two sacrifices (offerings) that are coming together so that the one becomes truly present in the other, and indeed, as the other, and can be appropriated into the very being of everyone who receives it. What’s all this? This is simply people asking one of their own (the priest who presides) to bring their ordinary things to the dinner table. These ordinary things re-present (I hyphenated it on purpose so you’d say “REE” instead of “REH”) their labor, their work, their time, their blood, sweat, tears, energy, and talents. These realities are all bound up in the sacrifice (offering, gifts, etc.) of these ordinary elements. It’s kind of like saying, “God, by giving you these ordinary elements, we are all here together saying that we give you our entire lives. We surrender all!” This first sacrifice is communicated on behalf of all the people by one person who has been designated to stand in for all of them with bread, wine, and water. Second: The Sacrifice of Jesus – During the liturgy, the priest will then ask Jesus (who died for our sins, once and once only, two thousand years ago, and who rose from the grave, and who ascended to God’s right hand, ever-alive and ever making intercession for us, cf. Heb. 7:25) to come and make what He has done on the cross a present reality, and to join who He really is (the crucified and risen Lord of Lords), to those ordinary elements. Jesus, who, as it says in the book of Revelation, is “a Lamb, looking as if it had been slain, standing at the center of the throne” (Rev. 5:6) graciously answers the prayer of His people, and comes to be fully present in the midst of His people in the consecrated bread and wine. He is not “re-sacrificed,” but rather, his once-for-all sacrifice is “re-presented” (there’s the hyphenation again), and becomes a truly-present (i.e. “real presence”) reality available to His people. BY GOD!!! 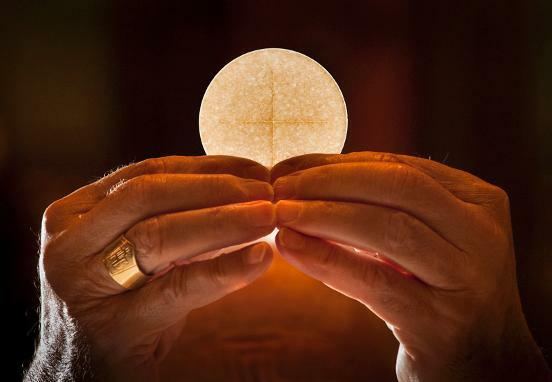 – that ordinary bread, water, and wine are really and truly joined, body, blood, soul, and divinity, by the once-for-all crucified and risen Jesus who lives and reigns at God’s right hand. He is not (!!!!) re-sacrificed at the Mass. Rather, his once-for-all sacrifice is re-presented to God’s people in the sacrifice (the ordinary food and drink) they brought to him. When I married my wife almost 26 years ago, we both brought ourselves to a Church in front of a couple hundred of our friends. We also asked our pastor to preside over our public offering of ourselves to one another. In that gathering, I said to MaryJo (in so many words) “I accept you as my wife, and I offer myself to you alone as your husband.” Then MaryJo said to me (in so many words) “I accept you as my husband, and I offer myself to you alone as your wife.” But that wasn’t the end of it! Nope, the pastor got in on all the action and said something amazing. He said (if you can imagine it! ), “By the power vested in me as a minister of Jesus Christ, I now pronounce you husband and wife. What God has joined together, let no man separate.” Then we kissed, and the pastor stepped around to the side of us and said something very amazing! He said, “Ladies and Gentlemen, let me be the first to present to you, Mr. and Mrs. Kenny and MaryJo Burchard.” Guess what – that is not who we were until all of this happened just as it did. Now I’m really a husband, and that’s really Jesus! Upon the legitimate offering of ourselves, and with the help of a legitimate set of words, and the assistance of a legitimate pronouncement by a legitimate minister with legitimate authority, I truly metamorphosized into something called a “husband” and MaryJo really, actually, and truly metamorphosized into something called a “wife,” and we’ve been that ever since. (for help with this, read a bit about “speech-act theory” here). I get it. You may not be convinced because it’s true that if you look at a photo of us just before the pronouncement, and then just after, guess what – we look exactly the same! “How is that possible,” you might wonder after we had just been “pronounced” husband and wife? Shouldn’t we look different, weigh more, or undergo some kind of change in our ordinary appearance? Answer: No. Because (here we go again) — By God, we truly and really became one flesh — a husband and wife (if you don’t like the word “became” check out Gen. 2:24)! To put a really fine point on all this, I was not “just a symbol of a husband,” and she was not “just a symbol of a wife.” If after all that we were just symbols, then to hell with marriage! I didn’t want the symbol of a wife, and MaryJo didn’t want the symbol of a husband. And if the bread and wine are just symbols of the body and blood of Jesus, then in the words of Flannery O’Connor, “to hell with it.” I want the real Jesus — not just symbols of Jesus. He can, in other words, say, “Look! Here is Jesus!” That’s because… (here we go again, but)… by God, that formerly-ordinary bread and wine become the real presence of Jesus! Though the appearance remains, ordinary bread and wine do not! There is nothing left of them. They are gone forever. Only Jesus remains, just like un-married Kenny and MaryJo were gone forever too. Only “one-flesh-Kenny-and-MaryJo” remained after the sacred oaths and pronouncements. When we eat the bread and drink the cup we receive Jesus into our own bodies just as it was true that everyone who shook my hand and hugged MaryJo at our receiving line after our wedding really shook the actual hand of a person who was a husband and hugged a person who was really a wife – although we looked just as we did before the wedding took place. By God, it happens! Nobody shook the hand of a bachelor or hugged anyone’s fiancée at the end of it all. All that was gone. Something new had come into the world of reality. Don’t take me to a lab to test my blood for “husband DNA” or to look for the “wife-gene” in my wife. That’s not how it works. Don’t look for skin cells and hemoglobin in the bread and wine. You’ll only find what appears to be bread and wine. Instead, regarding the marriage example, receive (accept, submit to the reality) that although our appearance has not changed, our vows and the pronouncement of our union truly made us what we are. And instead, regarding the Mass example, receive (accept, submit to the reality) that Jesus has heard the prayers of his people, and those of the priest who stands up for all of them, and that Jesus has become really and truly present (that is, he has substantively offered his sacrifice to his people) in the bread and wine (which are the ordinary things that they sacrificed to him).